How to design Homemade Harry Potter inspired birthday cake. Prepared this cake for huge harry potter fans! The decorations were a blast! All the accessories around the cake are made of fondant. Birthday parties are incomplete without a tasty cake. Across the globe, Harry Potter have captured the hearts and minds of millions of children and adults too. Also, Harry Potter themed cakes are becoming more popular in the world of confectioner's. Frequently seen objects from harry potter cakes or cupcakes include the sorting hat, Harry Potter's glasses, his favorite pet snowy owl Hedwig, broomstick, golden snitch and many more. So friends surprise your kids with these fantastic, magical homemade Harry Potter Theme Cake. My harry potter themed cake received many woooows and ahhhhhs at the party, and was gobbled up in one sitting. 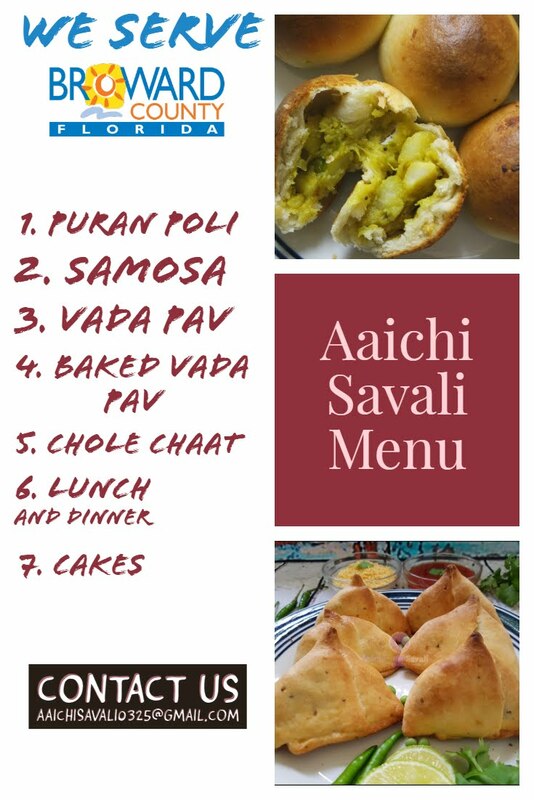 If you try it, feel free to share your photos and experiences with us. The cake is filled with buttercream frosting. For buttercream frosting click here. 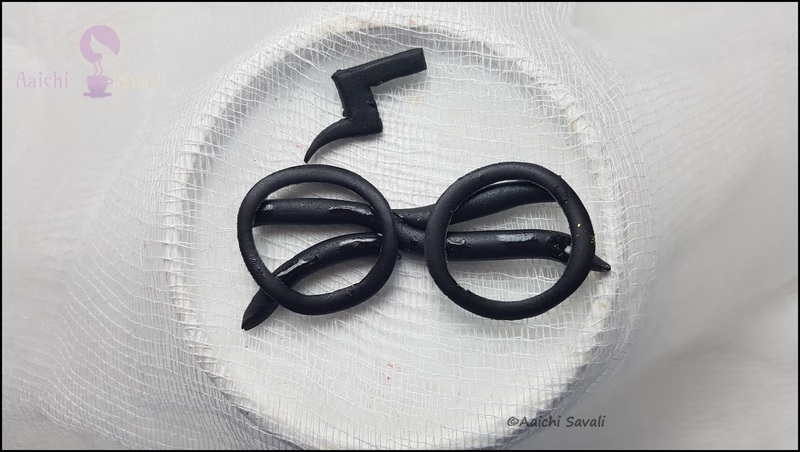 I assembled the accessories out of fondant, those are sorting hat, Harry Potter's glasses, wand, broomstick, golden snitch. The upper layer of cake is covered with white fondant and a bottom layer with red and yellow fondant. I have used dark brown fondant to make a sorting hat. make it a teardrop shape. Bend the bottom by pressing it on the table and sharpen the edge, then give a wavy effect at the top. Using fondant tools create mouth, eyes, and nose. 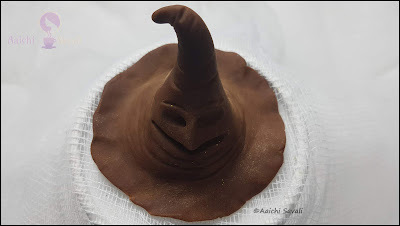 Lastly using fondant tool create wrinkles all around the hat, and a sorting hat is ready. Roll a small portion of dark brown gum paste/fondant, one end should be little and slightly pointer than the other. To Make Broom, roll fondant into a teardrop shape and make a little hole using a ball tool. Add glue and insert sticks handle into the Broom. Broom and at the end of the Broom make tiny cuts. 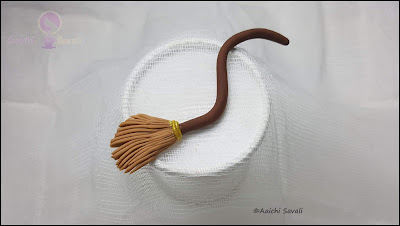 Use yellow fondant and cut it into little tiny strips and glue it around the handle of the broomstick. Roll out some black fondant, cut it into two circles using a round cookie cutter and then use 2A tip and cut the inner circles. To make the arms of the glasses, roll out the black fondant and cut it into the half. Give it a little bend and assemble the glasses, by placing one arm over the other and cut off the excess fondant and glue it. Now adding glue place the lenses over the arms and glasses are ready. 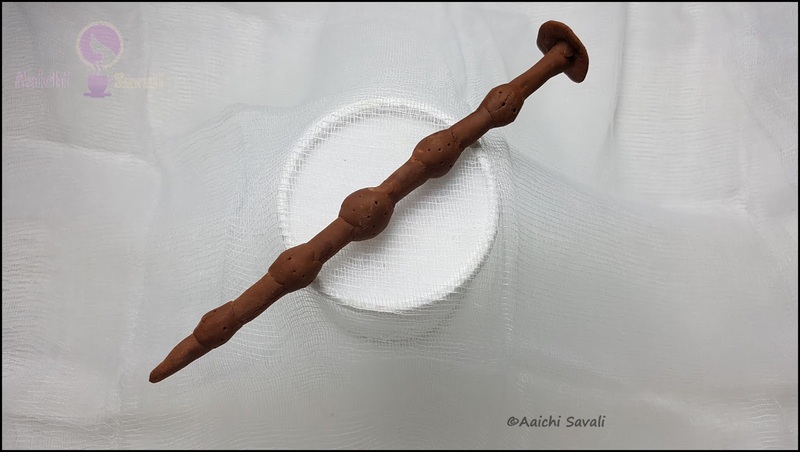 I have used brown fondant to make a harry potter's wand. The wand has a skewer in it to keep it straight. 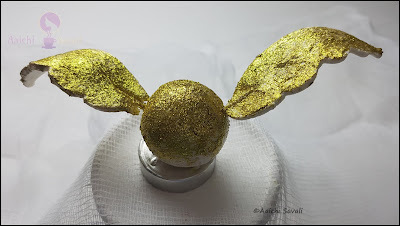 Roll white fondant into a ball and use golden dust to make it glittery. Roll white fondant and give it a wings shape, and at the end insert a toothpick to attach them to the ball and apply golden dust.